The Collabratech Blender is a closed-loop, control-based gas blending system combined with a built-in analyzer. It provides an accurate blend ratio at variable flow rates up to 250 slpm. These features, combined with intuitive PLC control software and a userfriendly touch-screen HMI, provide a safe, reliable and versatile gas mixing system. consistent results with varying flow rates and adjustable blend ratios. 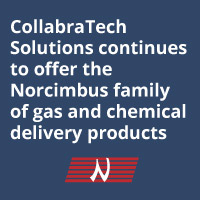 Collabratech’s extensive experience in gas systems provides system designs that ensure the best uptime in the industry with the most stable supply record. 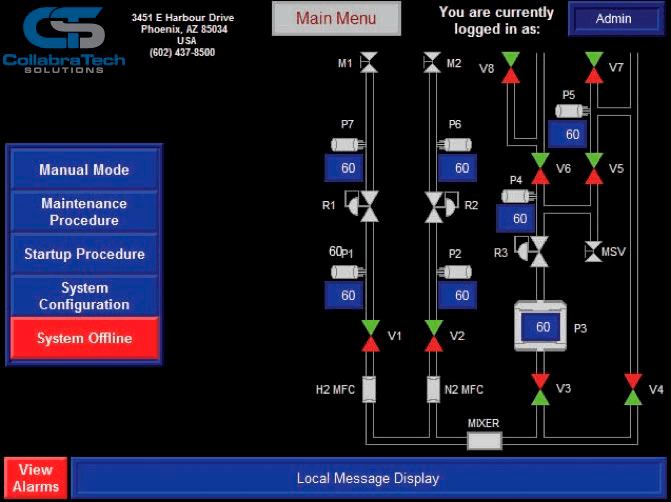 The system software is designed to improve efficiency and extend the lifetime of the tool. Contact Collabratech for more information about a system that matches your needs. The Blending System is designed to mix two gases to an adjustable ratio, and supply a variable flow up to 250 slpm continuously, with up to 300 slpm peak flows for brief durations. A concentration analyzer monitors the mixture and adjusts the blend ratio to maintain the concentration set point. The system is designed for accuracy within 0.3% of the set point value at 72°F (22.2°C) with the minor blend component set point below 10% of the mix ratio. Adjustable set points and alarms allow the operator to safety operate and monitor the system.